With blogging becoming a key content marketing activity, it’s crucially important that businesses large and small work as efficiently as possible in order to create a continuing flow of fresh, relevant blog content. The more you blog, the more you need a simple, scalable way to track your previous blog posts and plan your future blog content. Below is a simple Blog Post Tracker I created for my own use, as well as for use with my clients. Although I created it using Mindjet’s MindManager for Windows, it’s based on features found in many mind mapping software programs. Here’s a tip: If you’re a MindManager user, you can download the MindManager file at Maps for That; others can explore the Tracker using the interactive Mindjet Viewer (found at the same URL). Keeping track of previously published blog content: Every blogger needs an easy way to track and access previous blog posts to note blog post popularity and comments. In a tracker such as this, you can include links that permit you to access original text and graphic files for future recycling and reformatting (as described in Arnie Kuenn’s Create Great Content: How to Get More from It by Repurposing). 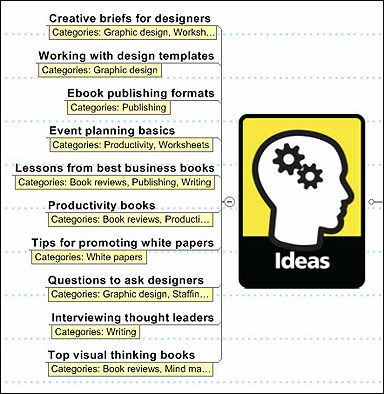 Planning and scheduling guidance for your upcoming blog content: The Blog Post Tracker mind map functions as an editorial calendar, displaying post ideas that are in progress, as well as those planned for the future, in the context of your previously published posts. This helps you avoid inadvertently over-emphasizing some topics while ignoring others. 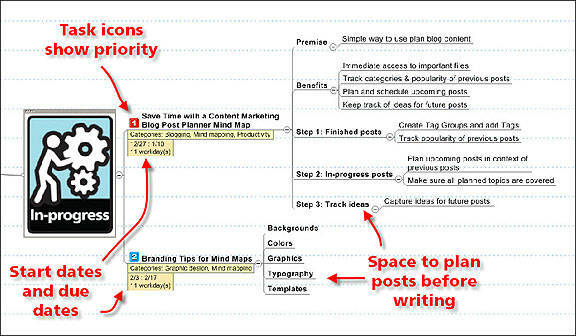 More importantly, you can enter start dates and deadlines on the mind map to keep your blog posts on schedule. Scalability: You can easily scale the Blog Post Tracker to accommodate hundreds of blog posts by adding tags and using MindManager’s filtering feature. Filtering permits you to display posts by category, status, or due dates. You can also use it to delegate tasks and track process. The Blog Post Tracker is designed to be used with the content dashboard I’ve developed, which contains links to all of my current projects and resources. You can set up your own dashboard to open by default each time you begin a working session. Start by copying and pasting the titles of previous blog posts, and add in the URLs for the actual blog posts as hyperlinks. This makes it easy for you to quickly revisit and review previous posts without having to search for them. Add subtopics and notes: Summarize the number of comments, “likes,” tweets, or whatever metrics you prefer for measuring the popularity of your blog post topics. Add tags to indicate each post’s category: Tags play an essential role in managing blog content. Each of your previous posts should be tagged with at least one category that reflects your core content themes. In my case, I use categories like blogging, graphic design, mind mapping, productivity, SlideShare, titles, white papers, and publishing. Tags allow you to later filter your maps, displaying only the blog posts associated with each category (as explained in Step 3, below). Tip: Before purchasing a mind mapping software program, make sure it allows you to add tags and use the tags to filter your mind maps. For example, if you use MindManager, you can easily add tags to one of your blog posts by right-clicking the blog post title, selecting Tags, and choosing your desired tag. Note that you can add multiple tags to blog posts — for example, this post could be tagged blogging, mind mapping, and productivity. Planning your upcoming blog posts within the context of your existing blog content helps you build on topics that have previously proven popular or have sparked a lot of comments. In addition, when appropriate, you can include links to previous posts. 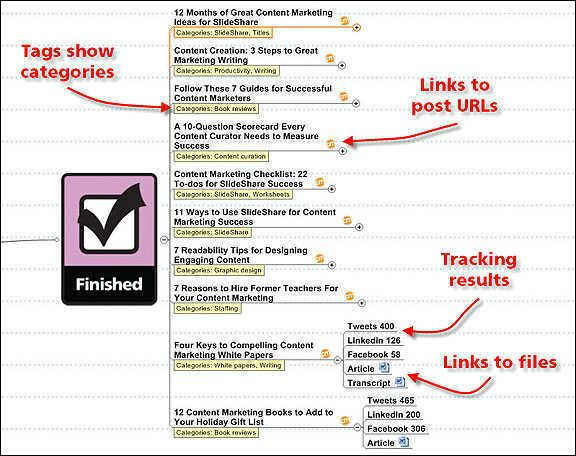 Although the Blog Post Tracker is designed to provide a “big picture” view of your blogging efforts, its overall structure encourages you to plan your upcoming blog posts in advance. The time you spend planning your blog posts will be repaid when you begin writing — start by identifying the main ideas you want to include in your blog post, then organize your supporting ideas in the proper order. Categorize, prioritize, and schedule your writing: When scheduling upcoming posts, start by adding the appropriate categories. Make your In Progress topics as visual as possible. Use Task icons to indicate priority and (if desired) Progress icons to display the current status of the post. Most importantly, you will want to add start dates and due dates for each post as soon as possible — this is a key step, as having targeted dates in view will help convert intentions into action. Later, you can use these dates to display only upcoming projects, or those that are behind schedule. Update your map: Immediately after submitting or publishing your post, grab it and move it to the finished topic list. I find that doing this in a timely manner is a good habit to build, and also serves as a pleasant reward for your efforts! Another important aspect of the Blog Post Tracker is the ability to add ideas for future blog posts as soon as they occur to you — as I mentioned previously, the longer you wait before adding a new idea to your mind map, the greater the chance that the idea will slip your mind. Avoid the temptation to wait until you have chosen a title for upcoming blog posts, or have “figured out” their structure. Just summarize the ideas, challenges, or topics you’d like to cover, and add details as they come to you. By linking your Blog Post Tracker to a centralized content dashboard and using cloud sharing services like Mindjet Connect or Dropbox, you’ll also have the ability to add ideas whenever or wherever they occur to you — on whatever device you have handy (smartphones, tablets, desktop computers, etc.). Filtering takes your blog post tracker to the next level. 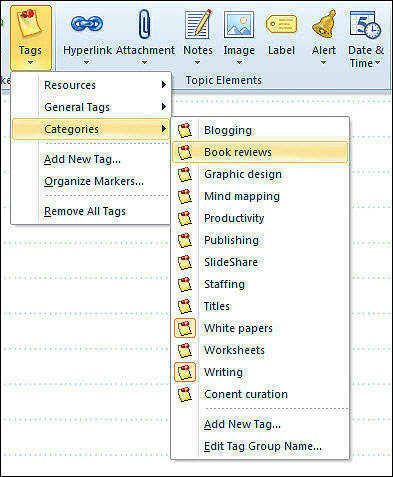 The tags you earlier added to your blog post topics now permit you to filter your mind map, displaying only the topics and categories you want to see at a given time. 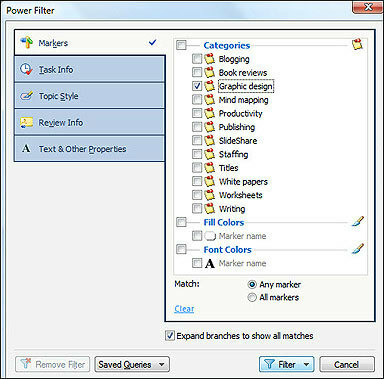 Tip: Using the Power Filter in MindManager for Windows (or other equivalent commands when using other mind mapping programs), simply select the topics tagged with the content categories you want to show. As the number of your blog posts increases, filtering will become increasingly important for organization purposes. Filtering also allows you to use your Blog Post Tracker as a project management tool. For example, once you get used to adding start dates and due dates to your posts, you can choose to display only the posts that you need to start working on, only those that are due next week, only posts that are overdue, etc. In larger content marketing departments, or when working with freelancers, you can also assign resources to indicate individual or department responsibility for the various tasks associated with each blog post. Once you familiarize yourself with the three-step Blog Post Tracker, you’ll undoubtedly come up with additional ways it can be used to suit your needs, such as for scheduling podcasts or tracking newsletter topics. Will the Blog Post Tracker work for you? 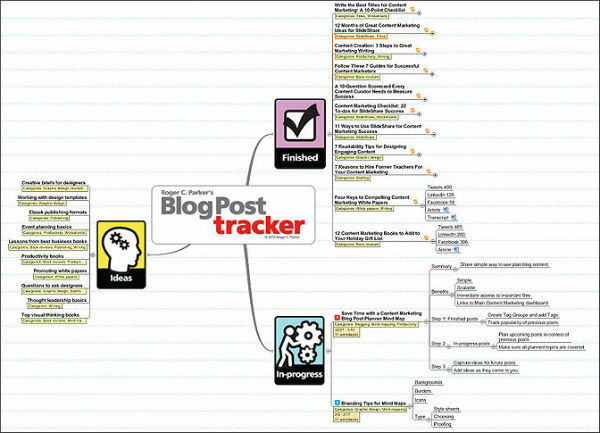 How does my mind map-based Blog Post Tracker differ from the way you’re currently tracking previous blog posts, planning future posts, and keeping track of new ideas? Would it work for you? Why, or why not? Share your comments and questions, below! Looking for even more guidance on how to incorporate efficient processes and procedures into your content marketing efforts? Read “Managing Content Marketing,” by Joe Pulizzi and Robert Rose.